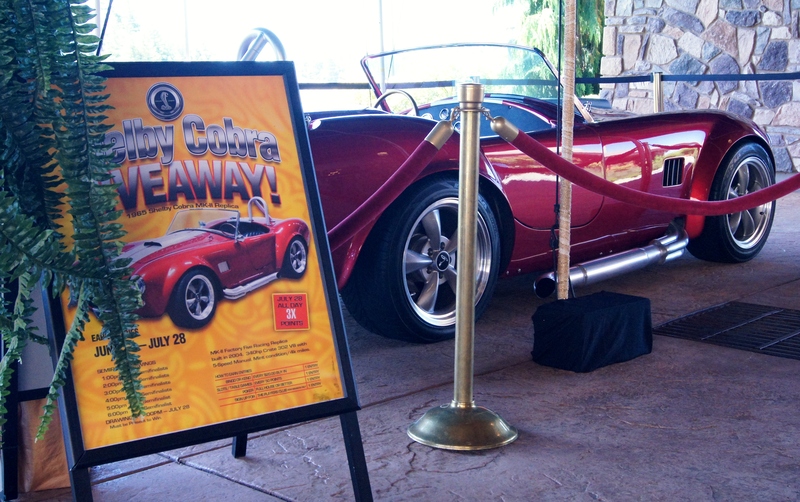 The Three Rivers Casino in Florence, Oregon is having a Shelby Cobra Giveaway raffle. What makes this raffle special is that it features West Coast Auto Enthusiasts very own 1965 Shelby Cobra Replica. The entries for the Cobra can be earned from June 17th through July 28th. The drawing for the winning entry will take place on July 28th and you must be present to win. This 1965 AC Cobra MK-II Replica was built in 2004 with a new crate 302 that produces 340hp. That power is transferred to the rear wheels through a 5-speed manual transmission. A parts car or donor car was not used in the manufacture of this Cobra, so all parts are crate new. 11 inch disc brakes all around give it tremendous stopping power and the coil-over suspension will allow tight hugging of curves. As expected, ground rumbling side pipes and a beautiful red paint job are sure to turn heads. We know that this Cobra will be adored by the lucky winner and it sure will be missed by us at West Coast Auto Enthusiasts. ~ by WestCoastAutoEnthusiasts on June 12, 2013.